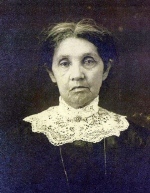 Malinda Ann Jones was born in Amity, Clark County Arkansas on October 19, 1854. She married James Dodd Cubage on May 9, 1878. Together they had 6 children: John Granville, Jesse, Winifred, Ludie, Lois, and Delia. Also they had two children that did not survive infancy. Malinda’s remarkable life spanned the Arkansas pioneer period and Civil War through World War II. As the eldest of the children she was expected to help raise and educate her siblings. This included, when being the first paid teacher, in the first free school of Caddo Gap, having eight of her brothers and sisters as her pupils. Deeply interested in family and local history, Malinda published five articles in the Arkansas Gazette, wrote personal account of family Civil War experiences, and documented family genealogy, inspiring including descendants, Frances Speer and Mary Jane McKinney, to follow in her steps. Malinda was not only interested in the past, but extremely proud of her family’s accomplishments going forward. Malinda passed away in February 4, 1948, and rests in the Jones Valley Family Cemetery.